Some things, despite being ancient, are never classed among the outdated. Vintage styles are one of them. Rich in history, they stand out for their simplistic, elegant designs. If you're looking for a unique bridal gown, you should visit vintage stores. You can obtain a dress that's one- of- its-kind at an equivalent price or lower than a brand new one. So, let's help you choose by walking you through the varied styles of the bygone era. The patterns belonging to the 1940s era witnessed a deep impact of World War II. Dresses were simple and functional because of severe restrictions on the usage of fabric. However, brides in the pre-war and post-war period (1930s and 1950s) wore elaborate wedding gowns with full skirts and heavy embellishments. The bodice on wedding gowns in the 1920s, 1930s and 1940s featured a loose fit. It was low waist and gathered. The neckline was high and usually sported a collar. Style changes were introduced in the 1930s. The waist was raised slightly and the necklines were lowered. In 1940s, the straight style with the cowl neck was a common sighting. The dresses did not have a distinct waistline. The V-neck and the high collared neck were in vogue. 1950s popularized the ultra-feminine look. Dress silhouettes went from unshapely to figure hugging. A-line dresses were all the rage. Gowns had wide shoulders and were stitched with a sweetheart neckline. Traditional brides aimed at creating a modest, conservative look. Hence, the long sleeves. Gibson sleeves, puffy along the arm and tight at wrist, were popular not only for wedding gowns but other attire as well. Another widely followed style was the bridal point sleeve. It resembled a tight fitting glove with a V-shaped fabric flap at the wrist pointing towards the middle finger. Typically, the dresses were long. The hemlines grazed the ankle or the floor. The short dress becomes popular in the 1940s. It wasn't exactly a dress but a skirt suit that hit at or below the knees. Some dresses had asymmetrical flutter hems. The most commonly used fabric was rayon. Dresses were also made of stain and silk, but were a rare sighting before the 1940s because it was very expensive. Embellishments were few. Lace detailing, Chantilly lace, become the rage with the close of the World War II. On some gowns, the sleeves were made of lace or sheer white cloth. 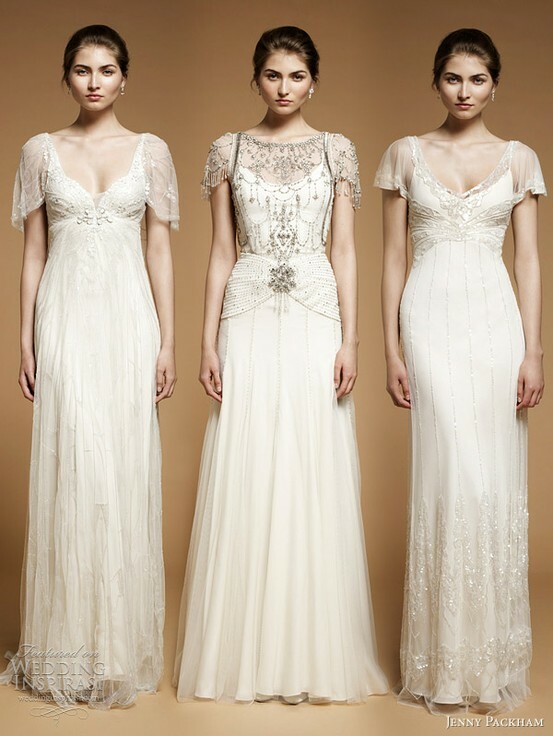 The dresses were embellished with lace motives. Gowns were fitted with metallic zippers. Before the metal zippers came to be used, buttons were used to secure the dress at the back. They extended from the neck to the lower back. These buttons were covered with fabric as a form of ornamentation. Ruffles and bows were also a characteristic of vintage wedding dresses. Vintage wedding dresses are difficult to come by. It is rare that you will find one at the local bridal boutique. Nonetheless, for a classic yet cheap wedding dress, how about sifting through your mother's or grandmother's wedding paraphernalia.